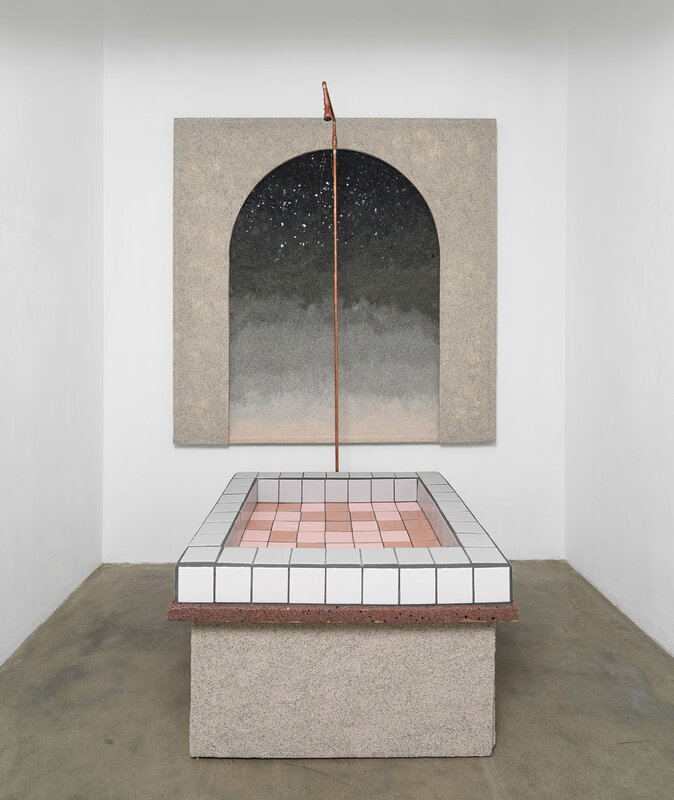 Kristen Lorello is very pleased to announce the second solo exhibition at the gallery of Los Angeles-based artist Rachel Higgins. An immersive installation of floor and wall-based sculptures continues the artist's work with interactive sculpture and performance. Please join us for the opening reception on Wednesday, June 6th from 6-8pm, with a 7pm performance exploring historical texts on feminist design and the social evolution of public and private space. Higgins's new installation transforms the gallery into an intimate and playful environment that appears both familiar and strange. Simple geometric forms and synthetic materials associated with present-day construction conjure the feel of a luxury bathroom, corporate lobby, or suburban mall. The focal point of the exhibition is a free-standing fountain the size of a personal shower. Operating on its own internal plumbing system, it constantly circulates water from a lower basin up through an overhead spout. Installed with architectural elements that signal an elusory recession of space, such as a textured wall relief fading along a gradient, a linear sense of time meets a cyclical notion of progress. As in previous works, Higgins transforms discarded construction materials from corporate and residential edifices into sculptures often coated with cerastone--a false stone typically used to surface building exteriors. Her new exhibition also ventures further into the realm of plumbing. Over the past year, Higgins has gained increasing expertise in this area through her work in California as a residential builder and a greywater systems installer. Greywater is lightly used water which can be captured and recycled, diverting it from the sewer to provide irrigation for plants. Here, Higgins appropriates elements of this environmental system for use as sculpture. This merging of the sculptural object, social commentary, and architectural design has been a constant in her work, which might also prod the viewer to consider broader political implications of how our social spaces are constructed, and for whom they are intended. Rachel Higgins (b. 1981, Laramie, WY) lives and works in Los Angeles, CA. Solo and group exhibitions include, "After Bedrock," The Bakery, Brooklyn, NY (2017); "Uneasy Structures," Hayes Valley Artworks, San Francisco, CA (2017); "City and City," Arnold and Sheila Aronson Galleries, The New School, NY, NY (2016); "Drawing for Sculpture," Tiger Strikes Asteroid, Brooklyn, NY (2016); "Rachel Higgins: Logistics," Kristen Lorello, NY, NY (2015); "I Serve Art," Dolly Mass Gallery, SUNY Purchase, Purchase, NY; and "Several Circles," Elizabeth Foundation for the Arts Project Space, NY, NY (2014). Recent performances and collaborations include "Breathe in the World," collaborative performance and sculpture for Jeanine Oleson's "Bureau of Feminism Residency," The Hammer Museum, Los Angeles, CA (2017); "Can you feel it," collaborative sculptures with Jeanine Oleson, Commonwealth & Council, Los Angeles, CA (2017); "Capitalist Realism Surimono," performance with Sophy Naess for "Temporal Month," Situations, NY, NY (2017); and "Parallel Park," Venue 447, San Francisco, CA (2017). She is the recipient of an Emerging Artist Fellowship from Socrates Sculpture Park, and has completed residencies at Real Time & Space, Oakland, CA, and the Lower Manhattan Cultural Council Workspace program, NY, NY, among others. Higgins received an MFA from Hunter College in 2010.